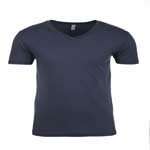 - Gildan Adult 4.5 Ounce Softstyle® V-Neck T-Shirt. - 4.5 ounce, 100% ring spun cotton preshrunk jersey with non-topstitched 5/8" mitered V-neck pattern collar. - Rolled forward shoulders for better fit. Gildan Adult 4.5 Ounce Softstyle® V-Neck T-Shirt. 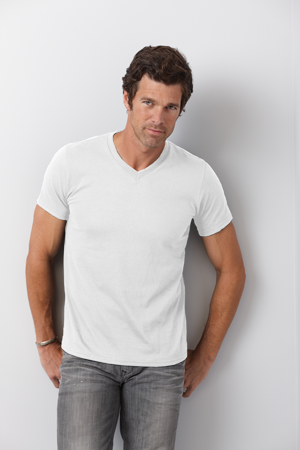 4.5 ounce, 100% ring spun cotton preshrunk jersey with non-topstitched 5/8" mitered V-neck pattern collar. Rolled forward shoulders for better fit. Quarter-turned body. Taped neck and shoulders. Double needle sleeves and bottom hem. Tear away label. Sizes XS-3XL: Neutral: White. Color: Black. Sizes S-3XL: Heather: RS Sport Grey (90/10). Colors: Charcoal, Cherry Red, Dark Heather (35/65), Heather Irish Green (35/65), Heather Navy(35/65), Heather Orange (35/65), Heather Purple (35/65), Navy, Royal, Sapphire.